Easy to use, versatile and uniquely equipped to handle transients, Harmonics is a distortion nut’s dream plugin. Dynamic Transient Control Filters and THD metering. Needs an automatic gain compensation option. The latest release from analogue modelling wizard Softube presents five distinct styles of harmonic saturation in a single plugin. Having spent the last ten years poring over a ‘what’s what’ of vintage hardware processors, the Swedish developer has “hand-picked the best-sounding components from legendary units and placed them in one box to deliver a musical and versatile palette of analogue flavours”. Harmonics’ (VST/AU/AAX) GUI is styled after a classic hardware box, and includes Softube’s monolithic and impractical preset browser, which we’ve reported on before and still really aren’t feeling. On the right, input and output levels are balanced using the so-named faders, each with its own peak level meter. 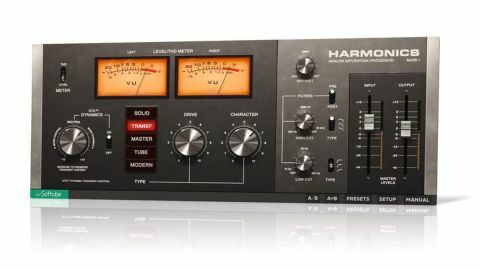 RMS metering is provided by a responsive pair of VUs, which, rather cleverly, can also be switched to monitor THD (Total Harmonic Distortion) - handy indeed when using Harmonics on the mix bus. The five red buttons select the saturation type, between them dishing up a broad range of colouration. Solid emulates the solid state studio hardware of the 70s, and comes across as the most ‘general purpose’ of the set. It’s ideal for adding definition and presence to pretty much any source signal, but seems particularly at home on vocals. Transformer mimics an American console transformer, and is especially adept at solidifying the low end. The inspiration for the Master type is unclear, but, as the name implies, it’s intended for use on busses and is thus the most gentle of the five. Tube models a boutique valve circuit from the 60s, and should be the first port of call for guitar. Oddly, though, it’s noticeably quieter than the other four types. Lastly, Modern is an English all-valve triode unit, and the most aggressive and destructive of the lot by a margin. The Dynamic Transient Control (DTC) knob sets Harmonics apart from other saturation plugins. Distortion inevitably has a destructive effect on the transients in a signal, flattening them out as they hit the dynamic ‘ceiling’. This can pull the life out of drums and percussion in particular, often requiring mixing back in of some of the dry signal to compensate. While Harmonics features a Dry/Wet mix control for doing just that, Dynamic Transient Control makes for a vastly preferable option. With DTC activated, Harmonics constantly analyses the dynamic profile of the input signal. The further the DTC knob is turned clockwise from centre, the more that profile is reimposed on the post-distortion output signal to increasingly dial the transients back in. Alternatively, twisting it anticlockwise pulls the transients down even further, effectively over-compressing the signal, and making it weightier and less dynamic. The Drive knob, of course, increases the gain of the signal into the saturation circuit. The higher it goes, the more distortion you get. Next to that, the Character control feels like a tilt EQ in use, but is actually rather more complex than that, with “mastering grade” filters configured specifically for each distortion type. Turning it increasingly emphasises high frequencies prior to distortion clockwise, and kicks up the low frequencies anticlockwise. The Low (10-400Hz) and High Cut (200Hz-20kHz) filters can be placed pre or post distortion, and each offer three slopes - 6, 12 and 18dB/octave. They prove hugely useful for taming low-frequency excesses and reining in overbearing top-end. Softube really knows its distortion modelling onions, so it’s no surprise that Harmonics sounds palpably ‘analogue’ and generally fabulous. Each of the five distortion types has its own character and comfort zone, and DTC (see Dynamic Transient Control) puts the plugin in a league of its own when it comes to saturating and overdriving drums without compromising their attack. Miked and electric sources are the primary targets, but electronic producers will have a ball shoving processed beats and synths through it. Our only negative (apart from the browser) is that with Drive and DTC adjustments often resulting in dramatic volume increases, an optional auto gain compensation function would be welcome.